Constructed of phenolic resin combined with macerated canvas, phenolic wheels are high impact resistant, and have a resistance to water, oil, and grease. Phenolic wheels offer excellent floor protection, while providing easy rolling and quieter operation when compared to steel wheels. Featuring a hardness of 90 Shore (D) Durometer, phenolic resin wheels are non metallic and sparkproof. Operating temperature range -50° to 250° F.
Note: Laminated phenolic and high temperature phenolic wheels available. Select the appropriate wheel bearing for optimum operation of phenolic wheels. 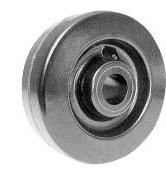 Call toll free 1-888-904-9531 for information and to place phenolic wheel orders. NCC-PHR3415 3-1/4 1-1/2 1-5/8 1-3/16 600 5/8 and 3/4 "
NCC-PHR3420 3-1/4 2 2-3/16 1-3/16 700 5/8 and 3/4 "
NCC-PHS415 4 1-1/4 1-5/8 3/4 600 - "
NCC-PHR420 4 2 2-3/16 1-3/16 800 5/8 and 3/4 "
NCC-PHR615 6 1-1/2 1-5/8 1-3/16 800 5/8 and 3/4 "
NCC-PHR620 6 2 2-3/16 1-3/16 1200 5/8 and 3/4 "
NCC-PHR625-1 3/16 6 2-1/2 2-3/4 1-3/16 1600 5/8 and 3/4 "
NCC-PHR625 6 2-1/2 2-3/4 1-15/16 1600 1 and 1-1/4 "
NCC-PHR625-3 1/4 6 2-1/2 3-1/4 1-15/16 1600 1 and 1-1/4 "
NCC-PHR630 6 3 3-1/4 1-15/16 2000 1 and 1-1/4 "
NCC-PHR820-1 7/16 8 2 2-3/16 1-7/16 1400 7/8 and 1 "
NCC-PHR825-1 3/16 8 2-1/2 2-3/4 1-3/16 2000 5/8 and 3/4 "
NCC-PHR825 8 2-1/2 2-3/4 1-15/16 2000 1 and 1-1/4 "
NCC-PHR825-3 1/4 8 2-1/2 3-1/4 1-15/16 2000 1 and 1-1/4 "
NCC-PHR830 8 3 3-1/4 1-15/16 2500 1 and 1-1/4 "
NCC-PHR1025-1 3/16 10 2-1/2 2-3/4 1-3/16 2500 3/4 and 5/8 "
NCC-PHR1025 10 2-1/2 2-3/4 1-15/16 2500 1 and 1-1/4 "
NCC-PHR1025-3 1/4 10 2-1/2 3-1/4 1-15/16 2500 1 and 1-1/4 "
NCC-PHR1030 10 3 3-1/4 1-15/16 2900 1 and 1-1/4 "
NCC-PHR1225 12 2-1/2 2-3/4 1-15/16 3000 1 and 1-1/4 "
NCC-PHR1225-3 1/4 12 2-1/2 3-1/4 1-15/16 3000 1 and 1-1/4 "
NCC-PHR1230 12 3 3-1/4 1-15/16 3500 1 and 1-1/4 "
NCC-PHR1235 12 3-1/2 4-1/4 2-7/16 4000 1-1/4 and 1-1/2 "
NCC-PHR1240 12 4 4 2-7/16 4000 1-1/4 and 1-1/2 "
NCC-PHR1630 16 3 4-1/4 2-7/16 4000 1-1/4 and 1-1/2 "
NCC-PHR1640 16 4 5-1/4 2-7/16 8000 1-1/4 and 1-1/2 "
NCC-PHR1830 18 3 3-1/4 1-15/16 3500 1-1/4 "